Veja os tesouros mundiais da Galeria Ufizzi em Florença sem esperar em longas filas de entrada. Evite as filas com um ingresso especial e explore as galerias históricas que abrigam obras de mestres da renascença, como Botticelli, Michelangelo, Caravaggio e Leonardo da Vinci. Seu ingresso também inclui acesso ao museu de exposições especiais rotativas, de modo que você não perderá nenhum detalhe. 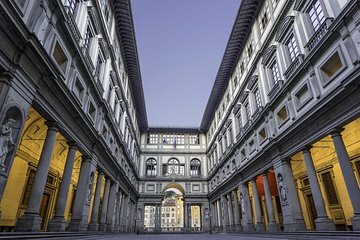 Escolha entre os vários horários de entrada diários para se adequar à sua programação turística, e siga o seu caminho para a Galeria Uffizi no horário predeterminado para receber seu ingresso. Evite as longas filas de entrada, que podem se estendem por horas nos horários de pico, e siga diretamente para dentro da suntuosa galeria para começar a explorar no seu próprio ritmo. O museu abriga uma das mais renomadas coleções de arte renascentista do mundo, incluindo os destaques, como A Anunciação, de Leonardo da Vinci; Doni Tondo de Michelangelo e o Nascimento de Vênus de Botticelli. Pesquise outras pinturas e esculturas do século XIII ao XVIII de acordo com seu próprio ritmo e preferências. O edifício em si é uma obra de arte, projetado no século XVI para Cosimo I de Medici pelo famoso arquiteto e artista Giorgio Vasari. Visite o café no terraço de Uffizi para uma pausa ou simplesmente para saborear as vistas estelares da vizinha Palazzo Vecchio. O acesso a exposições temporárias e exposições especiais também está incluído no preço do ingresso, para que você possa aproveitar o calendário variável do museu de visitação e obras temáticas de toda a Europa. This is was a skip the line tour, so no guide. Was my second trip to the Ufizzi. As awesome, breathtaking and incredible as the first time. You can never have enough time or opportunity to spend at the Ufizzi! Skip the line tour is totally worth the investment. Since we were there so late in the year, I'm not positive we really needed to get these. But we got right in and tried to make good use of our time. Museum is great! Skipping the line is great! Having to print your ticket sent specifically from the museum that gives you a time you don’t select ahead of time is not great. Room after room of great treasures and masterpieces. A remarkable museum of Renaissance art. You will see artwork that is just breath taking and remarkable in it's size and scope. Much of it painted and sculpted over 600 years ago. There is no place like it. Florence is a city for art and this is one of the finest places to see it with your own eyes. Waiting in line is just a waste of your valuable time. SKIP THE LINE is well worth it! The pick up location for the tickets is adjacent to the Uffizi so that was convenient. Only negative is that they only allow you to pick up the tickets 30 minutes before your entry time. Would have preferred to pick up our tickets much earlier and come back at our pick up time. As it was, we waited in line to pick up our tickets, then waited again until our entry time in the Gallery line. Would much prefer to have the option of picking up our tickets any time wanted and browsed the area shops instead of waiting for our entry time. This skip-the-line booking is necessary and reasonable. It worked perfectly. Viator's skip the line vouchers should be used everywhere where there is a line. I would highly recommend buying a skip the line pass for this place. The general admission line had an hour wait and after walking miles all day, we were very happy to be able to go right in. This place is very beautiful and laid out in a way that allows you see all the major pieces. A great visit!